Every year, March brings two kinds of spring blooms to the temperate British Columbia coast: one involves an annual flower count, which is the envy of the country; the other turns the Salish Sea green with an explosion of marine productivity. BC Ferries plays an important role on both counts, bringing visitors across the Strait of Georgia to enjoy the Island’s blossoms while simultaneously hosting Ocean Networks Canada’s (ONC) instruments that collect marine data in the Strait of Georgia. VICTORIA, B.C. 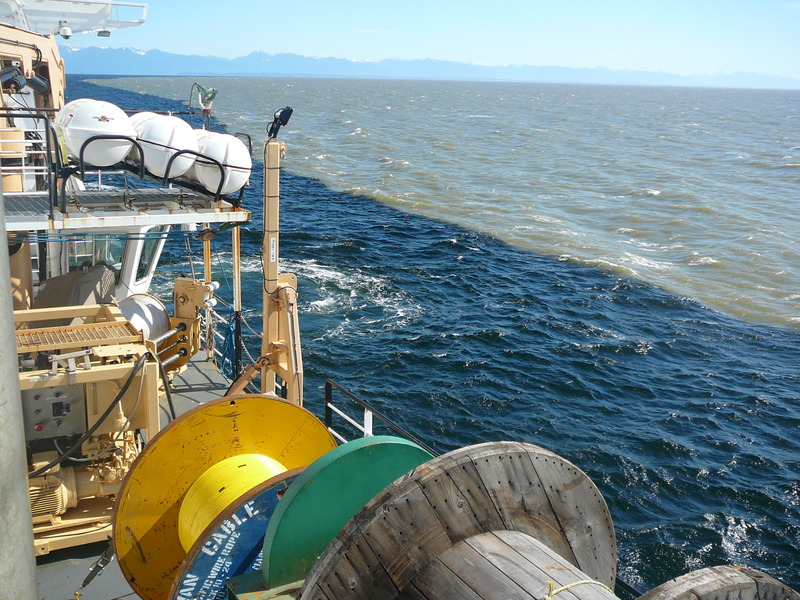 — The University of Victoria’s Ocean Networks Canada (ONC) has expanded its world-class ocean observatories to include data collected from three BC Ferries. With instrumentation in the ferries’ hull and a weather station on deck, scientists can now observe ocean surface properties continuously while the ferries transit the Strait of Georgia between Vancouver and Vancouver Island. Blog post by Dr. Rich Pawlowicz. Originally published on Wiring the Abyss 2014 Expedition portal. Understanding how the oceans work is hard, because we almost always don't have enough measurements to even know what the ocean is doing, never mind why. One of the exciting things in the VENUS Observatory expansion plan was the installation of a radar system that was specially designed to provide estimates of surface currents over a large region covering the Fraser plume. What's the Fraser plume? The biological transition from winter to spring conditions in the Strait of Georgia is characterized by a spring phytoplankton bloom. Inter-annual timing of this phytoplankton bloom can vary by up to 6 weeks (Collins et al. 2009). This broad time range introduces the potential for a mismatch in the timing of the major annual period of zooplankton productivity in the Strait, which can in turn, influence the productivity of higher trophic levels such as fish and sea birds. Understanding the dominant factors influencing the timing of the bloom is therefore the subject of considerable interest (Collins et al. 2009; Allen & Wolfe 2013; Gower et al. 2013).